FEE: $80.00 Includes material for two knives and "forks". 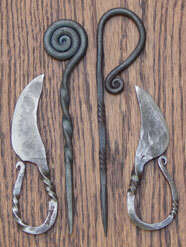 In this class we will make a small (about 4 inches total length) knife and "fork" no Viking would be without. This is this perfect first knife for those with little blacksmithing experience and also a great project for those with more experience. We will be making the knife of mild steel yet hardening it in a secret Viking way which will allow for a razor edge. Once the knife is done we move on to that essential eating tool – the one pronged Spisepind. Together, you will have a cutlery set the envy of all your fellow Norsemen and Norsewomen.